After reading the west slope of Changbai Mountain, we came directly to the Grand Canyon. The Jinjiang Grand Canyon is located on the west slope of the Tianchi Lake in Changbai Mountain. The Jinjiang Grand Canyon is 70 kilometers long and has an average depth of more than 80 meters and a width of more than 100 meters. It is V-shaped. It is a large landscape on the west slope of Changbai Mountain and is known as the “volcanic natural lava bonsai garden”. The Grand Canyon is caused by the earthquake caused by the Changbai Mountain volcanic eruption, and the faulty steep sag caused by the cross-cutting of the canyon has formed a number of stepped-shaped areas, resulting in waterfall landscapes and underground forest landscapes at different scales. The loose rock formed by the accumulation of volcanic ash develops into a variety of shapes under the cutting of the canyon stream under the wind and rain. The Grand Canyon can also see a lot of chipmunks, watching the chipmunk eating, is not super cute. The most famous of the canyon belongs to this pine-birth love. The pine tree is tall and straight, solemn and solemn, like a man with a masculine stalwart; the birch branches are stretched, and the body is graceful, like a feminine and pretty woman. This wonder is located below the alpine garden of Changbai Mountain. It is a mixed junction of coniferous forest and broad-leaved forest. It belongs to the representative plant pine and birch trees on the two vegetation belts. It is like two deep feelings. Like a lover, the roots are rooted, the branches are climbing, and the symbiosis is common. They are like a pair of lovers, dating on a soft grass like a carpet, and holding a grand collective wedding together. This is the strong “Love of Songhua” landscape. In fact, this is because the top area of ​​Changbai Mountain is high in altitude, the air is large and the wind is large, the soil layer is shallow and the water content is large. The individual pine or birch trees are not easy to survive here, and it is easy to be blown down by the mountain wind, and the two trees are accompanied by symbiosis. The roots of pine trees can be deeply plunged into the cracks of the rocks, and they are not pulled up by the wind. The roots of Yuehua can be widely distributed in the surface soil, which plays a stable role. This is the struggle between plants and harsh environments. The product is also the result of long-term selection and elimination of nature. In different seasons, “Song Hua Love” presents different scenes. Under the ladder cloud peak on the west side of Tianchi, there is a narrow long gully that extends more than ten kilometers. The river channel is steep and drowning, and it is stepped, so people call it the ladder river. The river is in a hurry, people can hear the rumble sound from a long distance, and the roar of the sound wall, also called the underground dark river. It is a large fault zone formed by crustal movement, with a narrow section and a width of more than three meters. The narrowest step can be crossed. The two walls are erect, such as a knife and axe, which is damp and smooth, with an average of more than ten meters and a depth of 30 meters. After watching the west slope of Changbai Mountain, be sure to take a look at the waterfall on the northern slope of Changbai Mountain. Changbai Waterfall is located on the north side of Tianchi Lake. At the end of the Weihe River, a waterfall with a drop of 68 meters is formed by the Weihe River at 1250 meters. It is named Changbai Waterfall because of the famous scenic spot of Changbai Mountain. 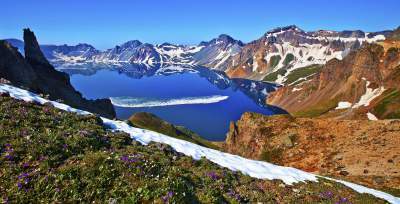 Changbai Mountain is one of the top ten famous mountains in China. It has been the sacred territory of China since ancient times and the birthplace of Songhua River, Tumen River and Yalu River. Walking along the plank road, you will pass through a hot spring zone, floating in the mist, feeling like a feeling of drifting in the clouds. Below the waterfall, to the hot spring pool, the terrain is in the shape of a U-shaped deep valley, about 300 meters wide and 100-200 meters deep. The valley is formed by the Quaternary glacial movement, the loose volcanic stratum, and the deep concave collapse structure. There are many kinds of hailstones on the four sides of Tianchi, and they are different in size. They are radiated to the bottom of the mountain. The two canyons are the largest, and there are rivers and hot springs. It is the famous U-shaped ice valley in the history of world geology. The valley walls are cold, the grass is green, the streams are flowing, and the hot springs are smoked. Below the waterfall, on the right side of the Erdaobai River, there are also high-heat type springs. The water temperature is between 60 and 82 degrees Celsius. The exhibition surface is about 1,000 square meters. There are more than ten spouts, also called gathering. Longquan. The group of dragons spit the beads and continue to do so; the mineral ions such as iron, copper, magnesium and manganese contained in the sulfurized water overflow and decompress and accumulate on the surface, forming a mineralized layer such as red brown, emerald green, purple, golden, etc. Natural oil paintings hang between the Grand Canyon. The hot spring can treat skin diseases, and when it is snowing, it is bathed in the open air and has a special style. The waterfall is pale and white, and it is suspended on the steep bluestone cliffs. It is foggy and foggy. It has been plunging all the year round. It has fallen into a deep pool of more than 20 meters, and its roaring sounds are moving; It is the source of Erdaobaihe and Songhua River. Changbai Waterfall is the crowning touch in many scenic spots in Changbai Mountain. Those who have been to Changbai Mountain are obsessed with the magnificent and eternal Changbai Waterfall! The silver flow seems to shed from the sky, and the ground is like a thunder. It is the best place to watch the waterfall at the Guanting Pavilion or the “Gaoyan Kiss Waterfall”. The water vapor is diffused, the rainbow mist is foggy, the beaded jade is attached, and the waterfall splashing gold is beautiful. If it is the midwinter season, it will have some more scenery. At first glance, the mountains are snow-capped mountains, the trees are snow-covered trees, and even the wind is sandwiched with snow. It is simply the world of snow! Also read, top five reasons why should you plan a group travel?